We arrived in Rodrigues a few days ago and never have I been happier to set foot on dry land. I’ve been walking around with a new and bountiful lease of life. The world seems better somehow – brighter, cleaner and generally more pleasant than I remember it. In all honesty, I had forgotten that it was possible to get this much enjoyment out of life. Of course escaping from a deathly cyclone probably has something to do with my enlightened feelings, but mainly my intense happiness comes from being away from the unforgiving high seas. This recent passage was a very difficult one for me. It turns out that my initial excitement in Indonesia of “having gotten over my sea-sickness” was completely unfounded. The seas in Indonesia were so wonderfully calm and the stark contrast of the reputably-lumpy Indian Ocean meant that I spent most of the passage in a prostrate position feeling very sorry for myself. I had very little energy or motivation for blog writing and anything I would have posted would undoubtedly have been very negative. I must admit that I did, in fact, write a blog towards the end of our passage but it ended up turning into an outlet for venting my frustrations. It’s actually quite hilarious to read back as it clearly demonstrates the psychotic episode of a woman going completely insane. In the end I decided not to post it for risk of sounding too negatively opinionated about the sea. I hope you can forgive me. 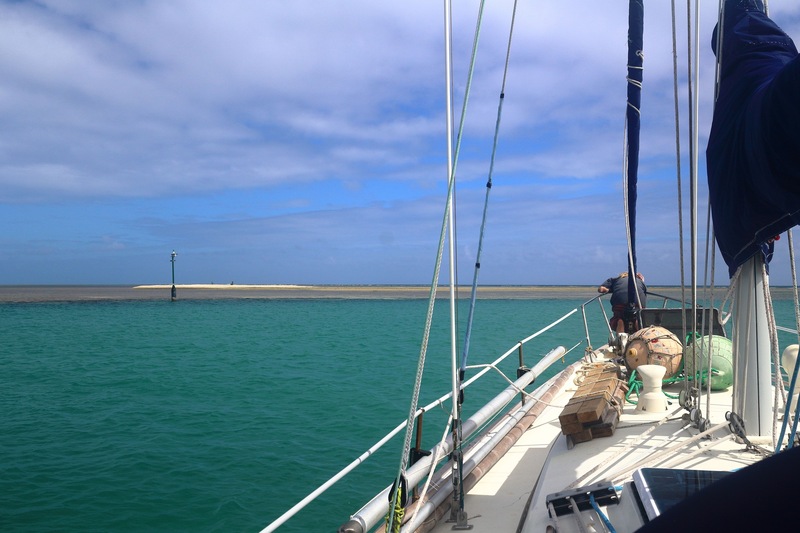 The good news is that we are now safely in Rodrigues and refuelling our energy reserves. The island is charming. It has a relaxed Caribbean feel alongside tasty French desserts. We went for our first snorkel yesterday and today we hope to rent a scooter and do a spot of sight-seeing. Apparently there is a lot of interesting endemic wildlife here along with some impressive cave networks, which I’m very much looking forward to seeing. Most of our boat jobs have been completed and we are ready to head back to sea once the time is right. We are keeping a close eye on the weather and assuming there are no major changes we hope to continue on to Madagascar on Wednesday morning. In the meantime, I am doing my best to repress the memories I have of the Indian Ocean so that I can bring myself to board Bob once again and head back to sea. It would be unfortunate for Rodrigues to acquire itself an illegal immigrant. Setting anchor in Port Mathurin, Rodrigues. 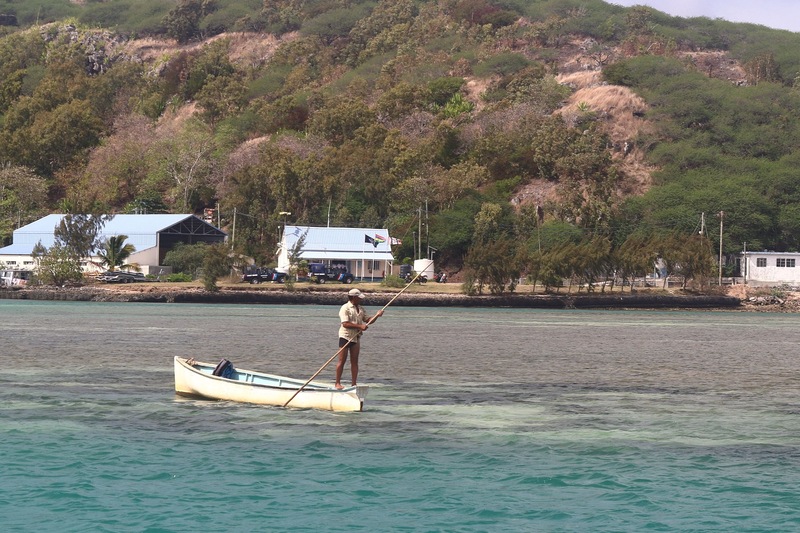 A local fisherman on the edge of the reef outside of the main town. Asma! It’s wonderful to hear from you. After 25 days at sea, all the positive energy in the world wasn’t going to save me 😂 But please don’t stop sending it! Knowing it’s coming my way will give me motivation for the next leg. Happy to hear you are well and loving life again, a big hug to both of you! Like I said to Asma, I’ll think about posting the negative blog or send it to you direct perhaps. The online world is scary and I’m very conscious of showing too much of myself on it. As someone who is prone to sea-sickness myself, I feel your pain! A single day of sea-sickness is horrendous – I can only imagine your ordeal. Hoping for calmer seas for you on the next leg. Enjoy Rodrigues! Our seafaring daughter spent some time there working on a tree clearing / endemic-species -planting project, and really loved the island and its people. She also loved Reunion, but it sounds as if the closest to there you’ll get is as a recipient of their weather forecasts. I am so enjoying your blogs, and full of admiration for you both – not just the adventure side of things but the way you share your thoughts about all you are seeing and experiencing. Thanks too to Alex’s aunt Vicky for suggesting I would enjoy them. I’m so happy that you are enjoying the blog 🙂 Alex’s family have been really great at putting people onto our website. That’s very interesting about your daughter’s time in Rodrigues. Do you know where the project was? We visited a reserve yesterday which is 20 acres of endemic plants with an introduced population of giant tortoises. As the local tortoises became extinct, they introduced some from Madagascar to fill the niche and help disperse the native plant species. I wonder if it was here where she worked? Charlotte is very excited to hear about the tortoises! She says that she worked for the Mauritian Wildlufe Foundation – but on Rodrigues of course – and that the reserve she worked on was on the other side of the island to the main town. She remembers the island being very bare but there was a nursery with hundreds of saplings in it, so perhaps now, 10 years or so on, there will be more in the ground now. She remembers being told about the tortoises’ extinction and how a tree species nearly followed the same path because it needed the tortoises to eat and poop out the seeds for them to sprout. Charlotte is very excited to hear about the tortoises! She says that she worked for the Mauritian Wildlife Foundation – but on Rodrigues of course – and that the reserve she worked on was on the other side of the island to the main town. She remembers the island being very bare but there was a nursery with hundreds of saplings in it, so perhaps now, 10 years or so on, there will be more in the ground now. She remembers being told about the tortoises’ extinction and how a tree species nearly followed the same path because it needed the tortoises to eat and poop out the seeds for them to sprout. So maybe some of the endemic plants you saw were ones she planted!